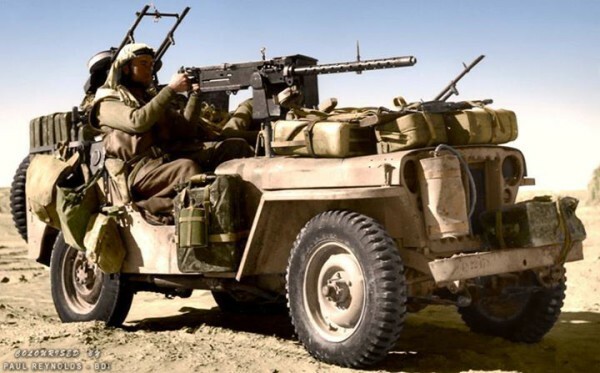 An SAS jeep (Sr/Nº4822478) in the Gabes-Tozeur area of Tunisia. The vehicle is heavily loaded with jerry cans of fuel and water, and personal kit. The ‘gunner’ is manning the .50 cal Browning machine gun, while the driver has a single Vickers ‘K’ gun in front, and a twin mounting vickers behind. 1943. Pilot Officer Albert Gerald Lewis DFC (aged 22) in his Hawker Hurricane Mk.1 (VY-R) P2923 with 85 Squadron RAF at Castle Camps, RAF Debden’s satellite airfield in Cambridgeshire. July 1940. 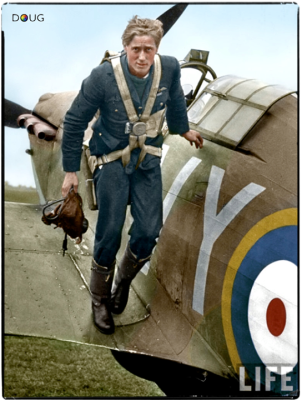 Albert Gerald Lewis (10 April 1918 – 14 December 1982) was a South African born fighter ace during the war, who was featured in a ‘Life’ magazine article about the Battle of Britain. Lewis received his Distinguished Flying Cross (DFC) in July 1940 and his citation read that during the Battle of France on May the 19th, he shot down five enemy aircraft before he himself was shot down over Lille. He then joined No.249 Squadron RAF on the 15th of September 1940. One the same day he shot down a Heinkel He.111 and on the 18th, a Messerschmitt Bf. 109 (his twelfth confirmed enemy aircraft). On the 27th of September he claimed 6 kills (three Bf 109s, two Bf 110s and a Ju 88), two probables and one damaged. While on a patrol on the 28th of September he was shot down and he baled out of his Hurricane over Faversham and was taken to Faversham Cottage Hospital, blind for two weeks, and with shrapnel in his legs with severe burns on the face, throat, hands and legs. He returned to the Squadron in December, 1940, having been promoted Flight Lieutenant on the 29th of November. He was flying by the 17th of January 1941, and became “A” Flight Commander, and was awarded a bar to the DFC. His final tally was 18 kills. Capt. Newhart was killed in action on the 12th of June 1944 during a mission over Northern France. 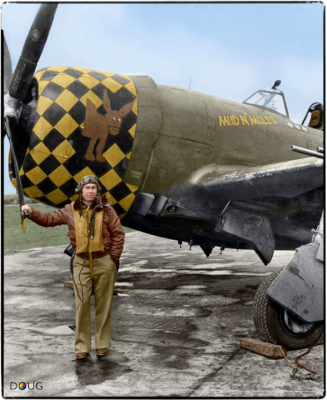 He was leading the squadron down to strafe an enemy truck convoy near Saint-Saëns, Normandy when he was jumped by 8-10 Bf.109s whilst flying a P-47D LH-U(s/n 42-26402) named “Soubrette”, he was hit and radioed that he was attempting to make landfall. Before he could escape, he was attacked by two more fighters, and was shot down and killed. The pictured aircraft was re-assigned to Capt. Lonnie M. Davis who renamed it “Arkansas Traveler” but retained the mule artwork out of respect for Newhart. 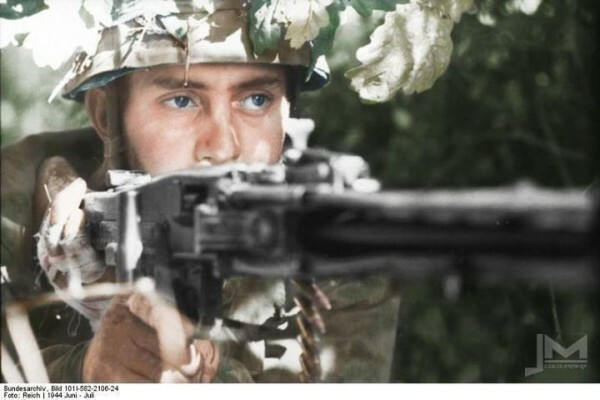 A German paratrooper (Fallschirmjäger) with an MG 42 (Maschinengewehr 42) machine gun positions himself to fire on Allied forces. Near Sainte-Mère-Église, Manche, Normandy, France. 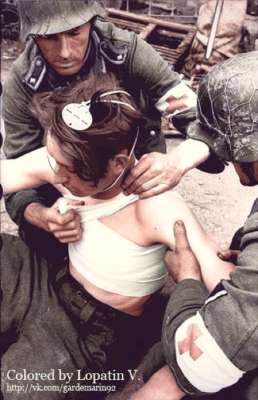 21st of June 1944. Although the Fallschirmjäger were actually Luftwaffe troops, these units were by the time of the Allied Invasion of Normandy, tactically subordinated to German Army (Heer) command. 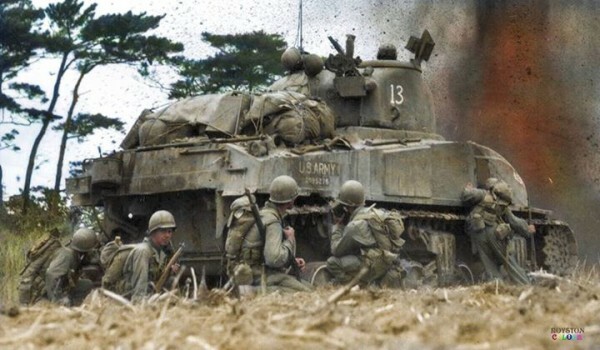 M4 Sherman (US Army 3099276) of ‘A’ Company 763rd Tank Battalion and troops from the 96th Infantry Division in battle at Okinawa, April 1945. 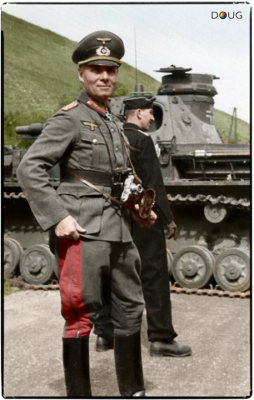 Major General Erwin Rommel, and an early Panzer IV (Nº321) of the 7th Panzer Division in France, May 1940. Erwin Rommel, is pictured here with his Leica III rangefinder camera. Rommel is reported to have been given such a camera by his friend/patron, Joseph Goebbels, before the 1940 Western campaign; many ‘photos of his authorship or probable authorship survive, and crop up with a fair degree of frequency in propaganda/publicity contexts. Rommel and the German 7th Panzer division in France 1940 He was given the command in the place of the both older and more experienced commanders. Inevitably, any account of the German 7th Panzer Division’s actions in France, 1940, to a large extent involves Erwin Rommel. Nevertheless, Rommel often showed audacity and never hesitated to take command of a situation no matter how big or small. He was a man of action, and it seems that he often reacted in a spontaneous and somewhat impulsive manner. His style of command and personality characterized much of the actions of the division. At the time of the campaign in France, Germany did not possess an overwhelming military strength. 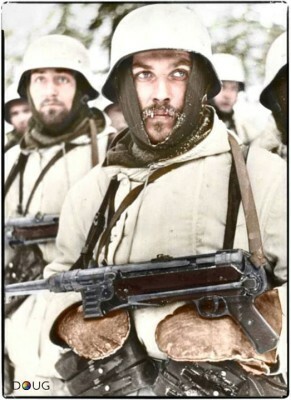 The Germans had 135 divisions compared to 151 for the allied side. Germany had some 2500 tanks while the allies had more than 4000. 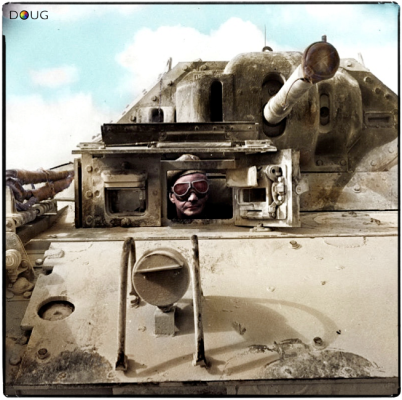 The German tanks were not technically superior to those of the allies. 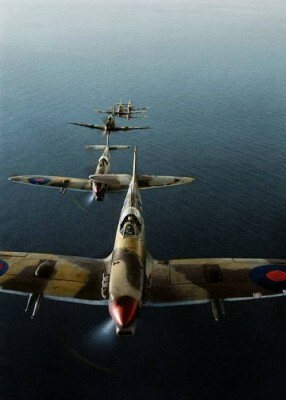 Only in the air did the Germans have superiority both in numbers of aircraft and in their technical performance. The German superiority, instead, lay in their tactics with narrow and deep penetrations. The Germans only had 10 Panzer Divisions, but they were used with a devastating effect when they were concentrated on a narrow front. Flying Officer Philip Ingleby 137140, the navigator of an Avro Lancaster B Mark III of No. 619 Squadron RAF based at Coningsby, Lincolnshire, seated at his table in the aircraft. February 1944. Taking off at 10.50 hrs on the 7th August 1944, the de Havilland Mosquito VI (s/n NT202) AJ-N of No. 617 Squadron, was on a training exercise from R.A.F. Woodhall Spa, Lincolnshire. It had completed three runs over the Wainfleet Sands bombing range and at 11.12 hrs. whilst pulling up in a climbing turn to port the starboard engine failed, followed immediately by structural failure of the starboard wing. Out of control, the Mosquito plunged into shallow water by the foreshore. The Pilot F/O. Warren Duffy (aged 21) and Navigator P. Ingleby (Aged 23) were both killed. T/Sgt. 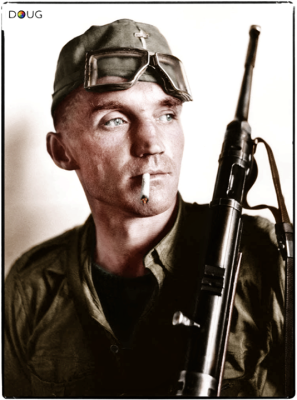 Benedict “Benny” Borostowski, ball turret gunner of Capt. Oscar D. O’Neil’s B-17 Flying Fortress “Invasion 2nd” (serial 42-5070) of the 401st Bomb Sq, 91st BG. The B-17 and crew were on a bombing run destined for the Focke-Wulf factory in Bremen on the 17th of April 1943 when it was hit by flak and crashed in the region of Nikolausdorf, near Oldenburg in Germany. “Invasion 2nd” formed the lead plane of the first element of six aircraft making up the lowest squadron. Taking flak hits and attacks by German fighters over the target, the number two engine was completely shot away. The left wing caught on fire and spread to the fuselage. Captain Oscar D. O’Neill called for the crew to bail out but Waist Gunners T/Sgts. Lapp and King were prevented from leaving by a stuck escape hatch. 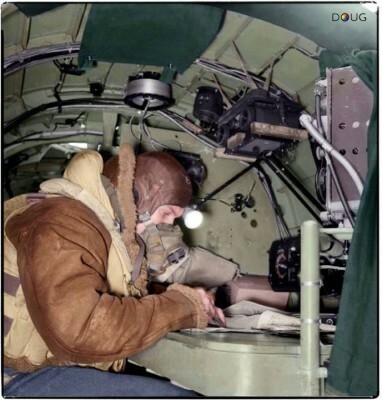 The ball turret gunner, Technical Sergeant Benedict B. Borostowski, came up into the fuselage from the ball turret and went to the partly open waist door. He found Lapp and King unable to force the door and used his foot to push both of them through. All of the crew members were able to leave the aircraft and survived the jump. They all spent the remainder of the war as POWs. 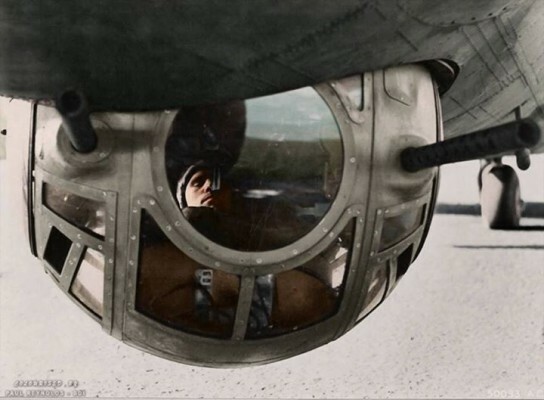 The ‘Sperry’ ball turret, meant for ventral defense needs on aircraft, was used on both the B-17 Flying Fortress and the B-24 Liberator as well as the United States Navy’s Liberator, the PB4Y-1. The Sperry ball turret was very small in order to reduce drag, and was typically operated by the shortest man of the crew. To enter the turret, the turret was moved until the guns were pointed straight down. The gunner placed his feet in the heel rests and then crouched down into a fetal position. He would then put on a safety strap, close and lock the turret door. The gunner sat in the turret with his back and head against the rear wall, his hips at the bottom, and his legs held in mid-air by two footrests on the front wall. This left him positioned with his eyes roughly level with the pair of light-barrel Browning AN/M2 .50 caliber machine guns which extended through the entire turret, and located to either side of the gunner. The cocking handles were located too close to the gunner to be operated easily, so a cable was attached to the handle through pulleys to a handle near the front of the turret. Small ammo boxes rested on the top of the turret and the remaining ammo belts were stowed in the already cramped turret by means of an elaborate feed chute system. A reflector sight was hung from the top of the turret, positioned at head height, there was no room inside for a parachute, which was left in the cabin above the turret. A few gunners wore a chest parachute. The turret was directed by two hand control grips with firing buttons similar to a one-button joy stick. Hydraulics normally powered elevation and azimuth. Hand cranks were available for backup. The left foot was used to control the reflector sight range reticle. The right foot operated a push-to-talk intercom switch. 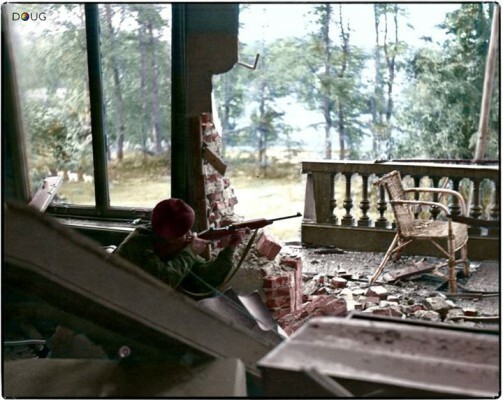 This photograph shows a British Paratrooper taking aim with an American M1 carbine from the first floor balcony of the Hartenstein Hotel in Oosterbeek, near Arnhem in The Netherlands. September 1944. 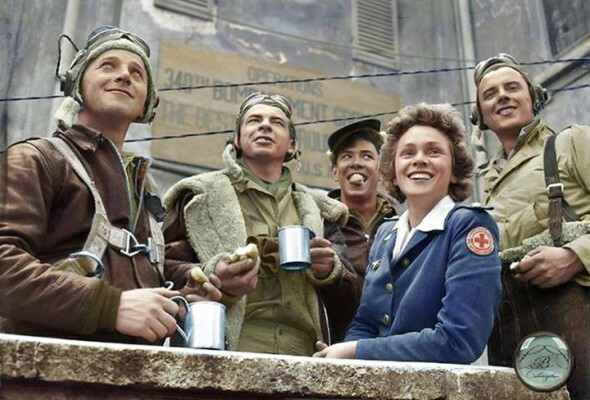 (The photograph was taken by Sergeant D M Smith, Army Film and Photographic Unit on Saturday the 23rd of September 1944.) 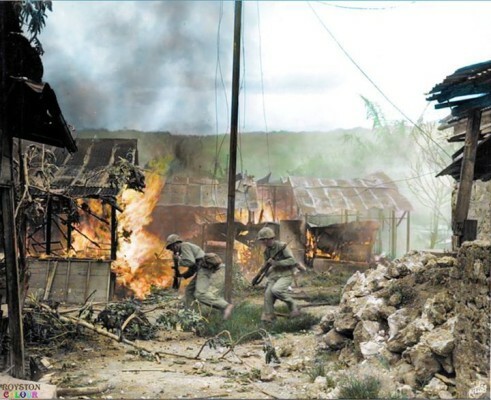 Sergeant Dennis Smith, the photographer, wrote: “We have had a very heavy shelling this morning, September 23rd and now the situation is serious. the shelling is hellish. We have been holding out for a week now. The men are tired, weary and food is becoming scarce, and to make matters worse, we are having heavy rain. 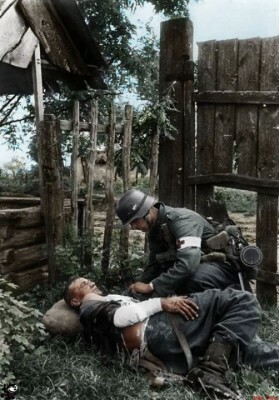 If we are not relieved soon, then the men will just drop from sheer exhaustion”. 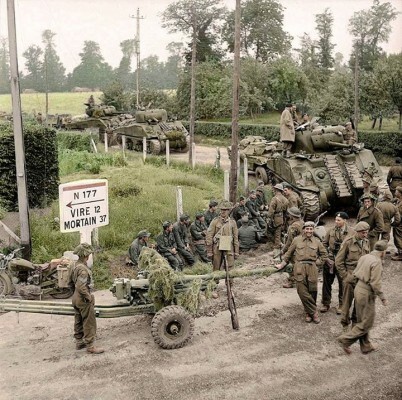 The British 1st Airborne Division headquarters had been established in the Hotel during ‘Operation Market Garden’ and it is now the Airborne Museum ‘Hartenstein’. 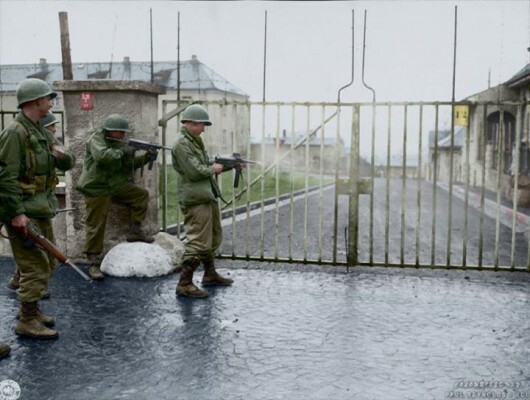 US troops from Combat Command B of the U.S. 14th Armored Division entering the Hammelburg Prison in Germany by opening the main gate with bursts of their M3 “Grease Guns”. Hammelburg, Germany. April 6, 1945. Hammelburg was a large German Army training camp, set up in 1893. Part of this camp had been used as a POW camp for Allied army personnel in World War I. After 1935 it was a training camp and military training area for the newly reconstituted German Army. In May 1940 the camp was established in wooden huts at the south end of the training ground. The first prisoners included Belgian, Dutch and French soldiers taken during the Battle of France. In May–June 1941 Yugoslavian, predominantly Serbian prisoners arrived from the Balkans Campaign, and soon after in June–July 1941 Australian and other British Commonwealth soldiers arrived, captured during the Battle of Crete. 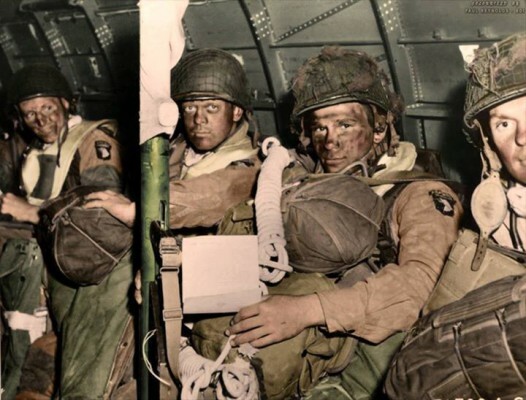 American soldiers that had been captured during the Battle of Normandy arrived in June–July 1944, and more from the Battle of the Bulge in January 1945. In March 1945 a large group of prisoners arrived in deplorable condition after marching the 500 miles from Stalag 13-D in severe winter conditions. “It seems the opening of the gates with machine gun fire is most likely symbolic and a show for the camera’s. 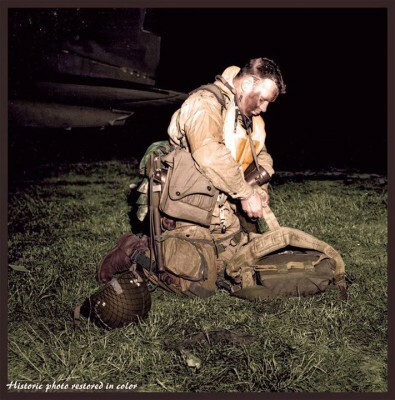 Lt. Col. Robert Wolverton, C/O 3 Btn, 506 Parachute Infantry Regiment, 101st Airborne Division, checking his gear before boarding the C-47 “Dakota”, 8Y-S, “Stoy Hora” of the 440th Troop Carrier Squadron at an airfield in Exeter, England. 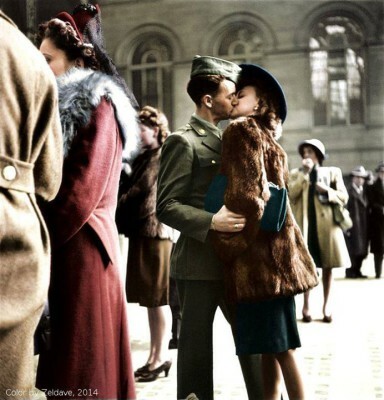 The evening of the 5th of June 1944. On that evening in June 1944, he gathered his men in an orchard adjacent to what is now Exeter airport, and said:“Men, I am not a religious man and I don’t know your feelings in this matter, but I am going to ask you to pray with me for the success of the mission before us. And while we pray, let us get on our knees and not look down but up with faces raised to the sky so that we can see God and ask his blessing in what we are about to do. “God almighty, in a few short hours we will be in battle with the enemy. We do not join battle afraid. We do not ask favors or indulgence but ask that, if You will, use us as Your instrument for the right and an aid in returning peace to the world.”We do not know or seek what our fate will be. We ask only this, that if die we must, that we die as men would die, without complaining, without pleading and safe in the feeling that we have done our best for what we believed was right. Sadly, within hours, the orator himself was dead; a cruel twist of fate meant his feet never touched French soil. Lt Col Robert L Wolverton (aged 30), was killed by ground fire and left suspended by his parachute from an apple tree in an orchard just north of the hamlet of St Côme du Mont in Normandy. 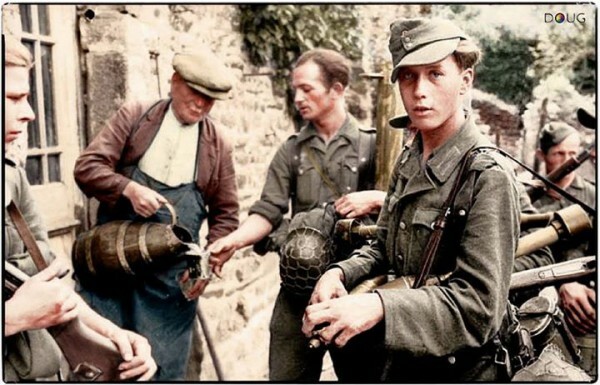 German troops, accepting a drink from a French villager somewhere in Normandy. Mid. 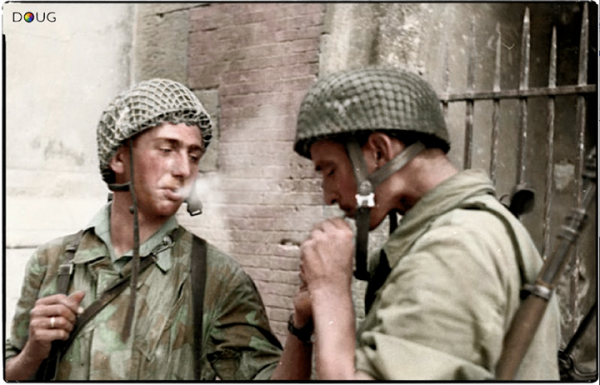 June 1944, after the commencement of the allied invasion.The soldier on the left is carrying a Sturmgewehr (STG.44) and in the centre is a Panzerschreck (RPzB.54 – anti-tank rocket launcher) and front right are the Gr.4322 heat rockets used with the launcher. Garapan, Saipan, Mariana Islands. 3rd of July 1944. 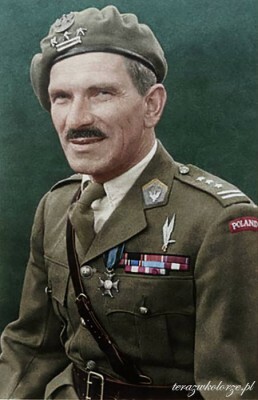 Stanisław Franciszek Sosabowski CBE (Polish pronunciation: [staˈɲiswaf sɔsaˈbɔfskʲi]; 8 May 1892 – 25 September 1967) was a Polish general in World War II. He fought in the Battle of Arnhem (Netherlands) in 1944 as commander of the Polish 1st Independent Parachute Brigade. 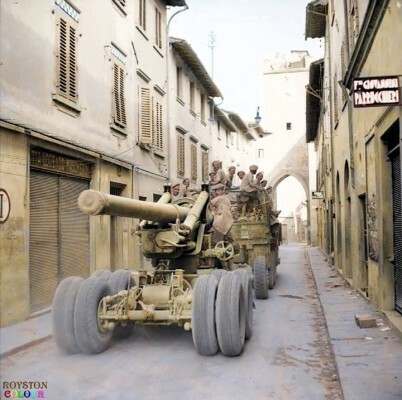 A 7.2-inch howitzer of the British Army’s 75th Heavy Regiment, Royal Artillery being towed through the narrow Via Giuseppe Mazzini by the corner of Via Oreste Bandiniin in the commune of Borgo San Lorenzo, Florence in the Italian region of Tuscany. 12th of September 1944. 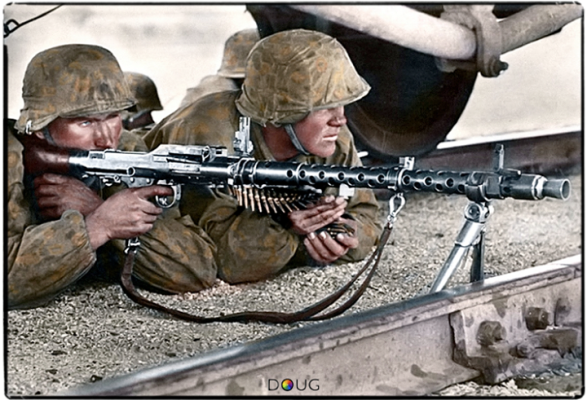 Wehrmacht troops on the Eastern Front (c.1942) They are seen here carrying the Maschinenpistole MP.40. 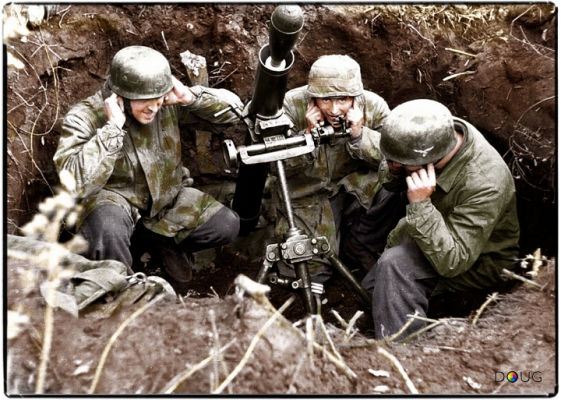 By 1942 the Wehrmacht (German Armed Forces) on the Eastern Front consisted of many volunteers from other countries, such as, Belgium, Spain, France, the Netherlands, Scandinavia, Croatia the Baltic States, Ukraine, Belarus, and the Caucasus. Dispositions on the Gothic Line August-September 1944, Defending the section of the line around Florence was I Fallschirm Korps of the Fourteenth Army. The 356. Infantry Division was positioned on the eastern flank, the 4. 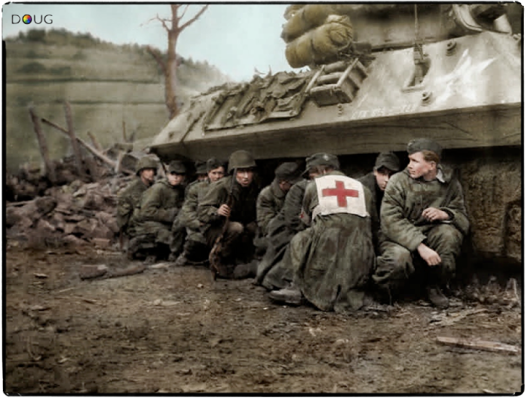 Fallschirmjäger Division was in the centre and the 362nd Infantry Division was on the western flank. They faced forces from the British 13th Corps and the US IV Corps. A Maquisard carrying a German MP.40 (Machinenpistole) at the time of the Liberation of Paris during August 1944. Photo © Izis Lithuanian born photographer, Izraelis Bidermanas “Izis”, found refuge in the region of Limoges during the Second World War where he joined the French Resistance fighters. During the Liberation in August 1944 he made portraits of his fellow “Maquisards”. The maquis increased fast with the reinforcement of many young men trying to escape the invasion by German troops in November 1942 and the STO(Service du travail obligatoire) in early 1943. Maquis operations changed from sabotages in 1943 to massive attacks against occupation troops in 1944. At its peak, the Limousine maquis is estimated to have reached between 8,000 and 12,000 fighters. Troops from the 101st Airborne with full packs and a bazooka, in a C-47 just before take-off from RAF Upottery Airfield to Normandy, France for “Operation Chicago. 5th June 1944. 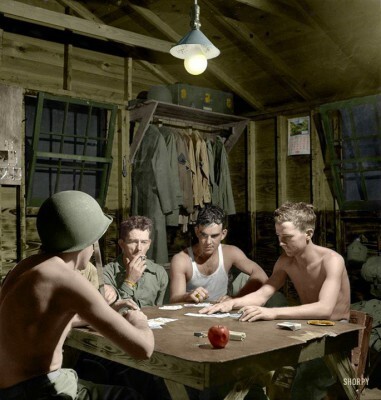 The division, as part of the VII Corps assault, jumped in the dark morning before H-Hour to seize positions west of Utah Beach. As the assault force approached the French coast, it encountered fog and antiaircraft fire, which forced some of the planes to break formation. Paratroopers from both the 82d and 101st Airborne Divisions missed their landing zones and were scattered over wide areas. From 00.15 in the darkness of June 6, 1944, when Capt. Frank L. Lillyman, Skaneateles, N.Y., leader of the Pathfinder group, became the first American soldier to touch French soil, and for 33 successive days the 101st Airborne carried the attack to the enemy. Private L.V. Hughes, 48th Highlanders of Canada, Cdn.1st Division sniping a German position near the Foglia River, on the Gothic Line in Italy. Late August 1944. 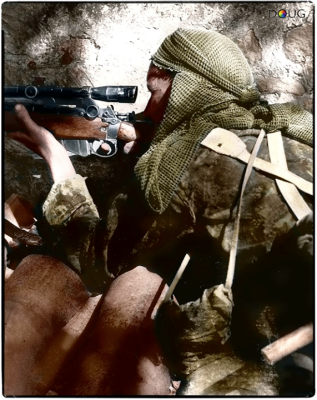 He looks to be using a Nº4 Mk.1(T) Lee Enfield Sniper Rifle with a Canadian made Nº32 R.E.L. Mk.III Telescopic Sight. While the Canadian 3rd Division troops had been in battle in France for almost 3 months, the Canadian 1st Division had landed in Italy from Sicily almost one year before, on the 3rd of September 1943. The 48th Highlanders (Toronto) approached ‘The Gothic Line’ — the next German line of defence and the next grand battle. The announcement was premature for the enemy recovered quickly, reinforced the Adriatic defence by moving divisions from other lines and thus, slowed the advance to Rimini to bitter, step-by-step progress. Three miles south of the Conca the forward troops came under fire from the German 1st Parachute Division, while to the west heavy fighting was developing on the Coriano Ridge. By hard fighting the Canadians captured the ridge and it appeared that the Gothic Line was finally about to collapse, but this was not to be. For three more weeks the Canadians battled to take the hill position of San Fortunato which blocked the approach to the Po Valley. On September 21, the Allies entered a deserted Rimini. That same day the 1st Division was relieved by the New Zealand Division to sweep across the plains of Lombardy to Bologna and the Po. But the rains came. Streams turned into raging torrents, mud replaced the powdery dust and the tanks bogged down in the swamp lands of the Romagna. The Germans still resisted. 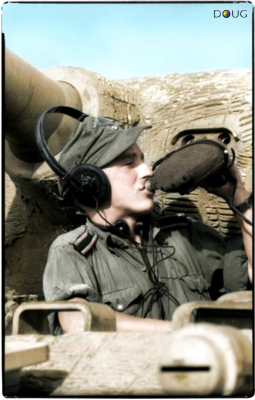 1 response to "30 Thought Provoking Colourised Images Of WWII"